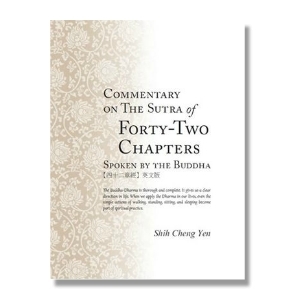 Sutra of Forty-Two Chapters covers the essence of the Buddhist teachings. For beginning spiritual practitioners, this sutra is truly the best entry point to the profound Buddha-Dharma. The first chapter of the Sutra of Forty-Two Chapters clearly illustrates the sequence we should follow in our spiritual practice. The second and third chapters are mainly written for those who are ordained as monastics, while the fourth chapter and the chapters thereafter are guidelines for spiritual practice for people in general. In simple and plain words, the Buddha used vivid metaphors to patiently and repeatedly teach practitioners at different levels of cultivation. He wanted to show people how to reflect on themselves and how to practice the renunciation of evil and cultivation of goodness to bring out their life’s full potential. He laid out a bright path that leads directly toward a state of purity. With these teachings, people can follow the right path and reach a pure state of peace and joy. Master Cheng Yen’s detailed explanations and apt interpretations have further closed the gap between this sutra and people living in our current time. We hope that those who read this sutra can inspire and encourage each other to walk the path. In doing so, they can share Dharma-joy and obtain the benefits of the Dharma together. The Buddha explained that the majority of sentient beings are constantly either doing the ten good deeds or the ten evil deeds. In general, the ten good deeds we refer to are just the opposite of the ten evil deeds. What exactly are the “ten evil deeds?” Three pertain to the body, four pertain to speech, and three pertain to the mind. The three evils pertaining to the body are killing, stealing, and sexual misconduct. They are impure actions carried out by the body, and they are thus called the three evils of the body. The four evils pertaining to speech are divisive speech, harsh speech, flattery, and lying. The three evils pertaining to the mind are greed, anger, and ignorance. What we call “good” and “evil” refers to karma that we create with body, speech, and mind. What is considered “good”? Actions that are in line with the principles of the Dharma can be called “good.” Actions that are in accord with truth, righteousness, benevolence, and moral values are good deeds, while actions that go against ethical and moral principles are evil deeds. If we practice the ten good deeds with body, speech, and mind in a manner that is not in accord with the right path, then we are committing the ten evil deeds. Conversely, those who stop doing evil deeds are in fact practicing the ten good deeds. Although good and evil are different concepts, they both arise from the mind. It is equally easy to do good deeds and to do evil deeds; it is simply a matter of “stopping” or “doing.” We must commit ourselves to stopping evil and doing good. To “stop” means to refrain from our evil thoughts and evil actions, and to cease bringing harm and trouble to others. To“do” means to put noble virtues into practice, to form aspirations to help others, and to bring peace to all sentient beings. Therefore, it is the good karma created by the body, speech, and mind that enables people to follow the right path. However, karma created by the body, speech, and mind can also cause people to descend into the evil realms. Take killing for example, one of the three kinds of negative karma created by the body. Killing is a cruel deed devoid of compassion and is something people should renounce. Instead, people should protect and save life. In Taiwan, there are people who buy animals that have been caught in order to release them, thinking that they are saving lives. However, this is not truly protecting life. Protecting life is about caring for the lives of all living beings and moreover, cherishing all things. If we can then go one step further to dedicate our own lives, open our hearts, and make vows to help people in need, then we are truly respecting life. For example, when we build a hospital to save people who suffer from illness, by saving one person’s life, we often save an entire family. With this kind of mindset, we can bring great benefit to both families and society. It is said, “All living, moving beings have Buddha-nature.” Every sentient being fears death and desires to live, and all sentient beings possess Buddha-nature just as we do. Therefore, we must renounce killing and nurture great compassion and sympathy for all living beings. Another kind of karma created by the body is stealing. When the mind harbors greed, it will give rise to thoughts of stealing or pursuing ill-gotten wealth. Not only should we refrain from greed and theft, we should take a step further and practice giving to others. This is how we can truly renounce stealing and practice the good deed of giving. Sexual misconduct is the third type of karma created by the body. Sexual relations between males and females is the source of cyclic existence for all sentient beings. Those who have taken the monastic vows must refrain from lust and engage in purifying practices. When we keep our bodies pure, it is considered a good deed. For lay practitioners, sexual misconduct refers to forming impure extramarital relations. This is a precept that we must absolutely never break. Through these practices, we can eliminate the body’s three kinds of evil karma and instead achieve the three kinds of good karma of the body. To eliminate negative karma of speech, we must refrain from lying. The way that a person speaks is a clear reflection of their character and temperament. If a person says whatever they feel like saying without restraint, they can cause harm to themselves as well as to others. For instance, “lying” is a kind of speech in which people say things that are unfounded and irresponsible. They may say things that are completely opposite from what is true. This causes others to develop bad impressions of them. For this reason, Buddhist practitioners must be strong in their resolve and maintain their integrity by refraining from lying and only speaking the truth. We must also “refrain from divisive speech.” Most interpersonal conflicts arise due to misunderstandings. There is a saying in Chinese, “One person’s falsehood is spread by ten thousand people as the truth.” Inciting conflict and sowing discord through our speech easily gives rise to misunderstanding. Beyond simply refraining from divisive speech, we should take a step further and try to use our words to bring people together. We should not fan the flames of discord, but instead serve as mediators so that harmony can be achieved between all people. On an organizational level, no matter how strong an organization is, it will face great challenges if its members indulge in divisive speech. In situations like this, virtuous people with good intentions can serve as mediators and help the organization to become strong, harmonious, and beneficial to society. Next, we must refrain from harsh speech. Uttering vulgar words or insults whenever we open our mouths is considered “harsh speech.” We must not only refrain from harsh speech, but must also cultivate good karma of speech by “speaking gentle words and words of loving-kindness.” A Buddhist practitioner must always exude an air of gentleness and grace. For this reason, we must refrain from harsh speech. Finally, we must refrain from flattery. There is another saying in Chinese, “Those who speak flattering words and put on false appearances rarely have benevolent intentions!” If we constantly engage in flattery to please others and do not speak from our hearts, then we are misleading others and bringing damage to ourselves. As Buddhist practitioners, we should speak the truth and be direct instead of putting on appearances. However, we should still speak kindly and gently. In doing so, we will bring a sense of beauty and elegance into both our lives and the lives of others. The three evils of the mind are greed, anger, and ignorance. These arise when we do not carefully safeguard our minds. Due to greed, anger, and ignorance, our minds are not focused on following the path. Of these three, it is especially ignorance that keeps us unfocused. As spiritual practitioners, although we may want to engage in spiritual practice, we are unable to uphold the precepts, and in our spiritual practice, although we may want to attain the state of Samadhi, we are unable to do so due to the three evils. The three evils of the mind not only cause harm to our own wisdom-life, but to other peoples’ wisdom-life as well.